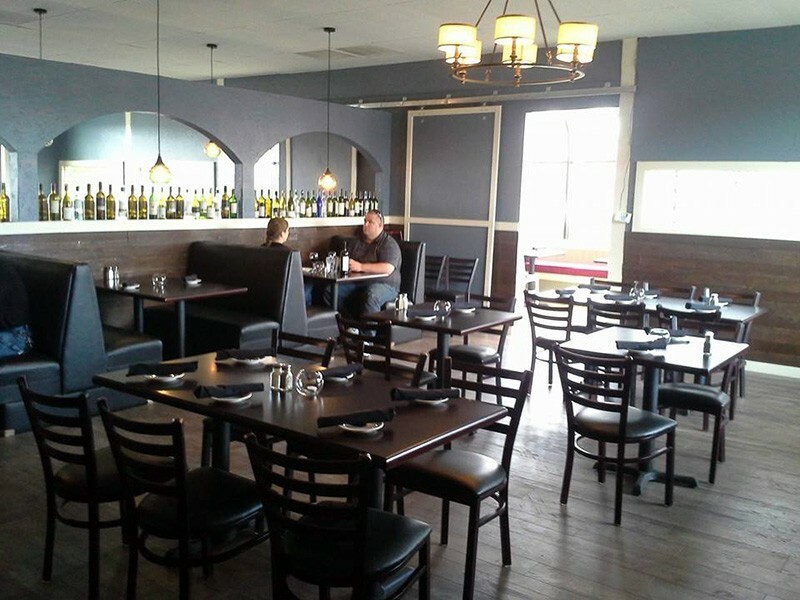 Uva Trattoria opened in Coeur d'Alene this week. A new Italian restaurant on Coeur d’Alene’s Fourth Street corridor, Uva Trattoria, is now open. An Italian deli, Marina’s New York Deli, opened recently in North Spokane, too. Read more about what both are offering in this week’s Entree newsletter. Java on Sherman is now open in their new location a few blocks down at 819 Sherman. Also changing location is North Spokane Mexican restaurant Pueblo Amigo, moving just a short ways from Francis down to a space near NorthTown Mall. A new cafe is coming to the International District location that was previously the Flying Pig: The Ivory Table, which is opening June 3. They’re currently seeking artists who’d like their work displayed. A new restaurant called Palouse Caboose is coming to Palouse, Wash., later this summer. More than 100 people were in line by 7:30 this morning for the opening of a new Papa John’s on the South Hill, hoping to be among the lucky first customers to win free pizza for a year. The owner is Matt Goodwin, who also owns Press, the Volstead Act and the Boiler Room. 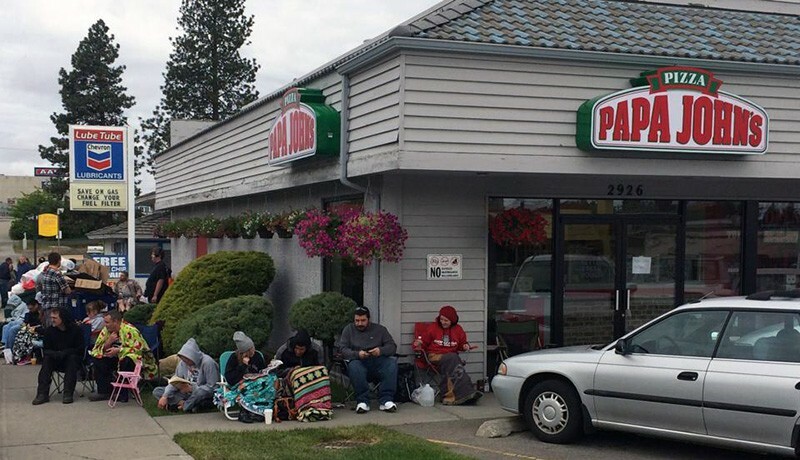 People got up really early this morning in hopes of winning free pizza for a year. With the new Target on the South Hill getting closer to opening, the developer announced some other nearby businesses, including a Cafe Rio and Anthony’s Beach Cafe. It seems like only a little while since we first found out about the pack of restaurants opening in Kendall Yards. With the Wandering Table now open — here’s the full story from this week’s issue — the only eatery still under construction is Veraci Pizza. And they’re in the hiring phase. It looks like designer extraordinaire Karli Ingersoll is working on the logo for Durkin’s Liquor Bar. As mentioned before, the new Main Avenue restaurant from the people behind Madeleine’s and Casper Fry is presumably named after Jimmie Durkin, famous liquor king of early Spokane. 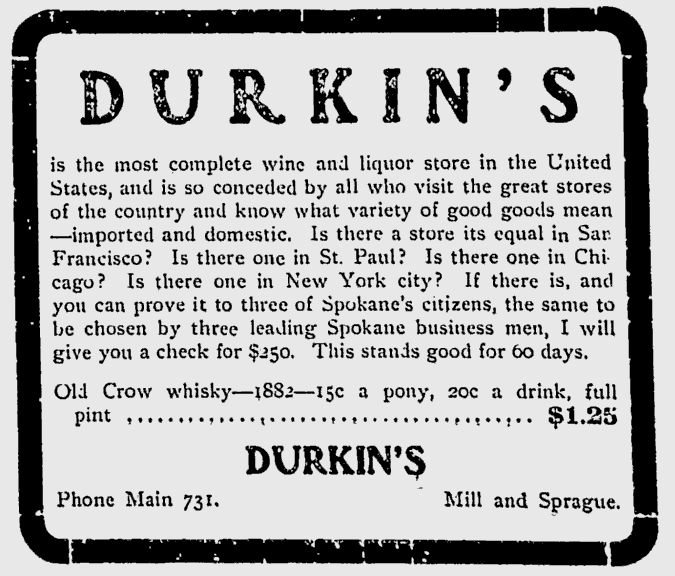 Looking through old papers, it doesn’t seem like Durkin had much consistent branding for his downtown stores — but he knew what he was doing with the ad copy. 1904 advertisement in the Spokane Chronicle. It’s on the other side of the state, unfortunately, but the Washington Brewers Festival on June 13-15 is the biggest one yet with 88 breweries, including a respectable Spokane-area delegation: Iron Goat, No-Li, Orlison, Paradise Creek, Ramblin’ Road and Twelve String. See the full list of breweries here and — just announced — what they’re all pouring. Paradise Creek is also celebrating its 4th anniversary tomorrow with three casks and other festivities. 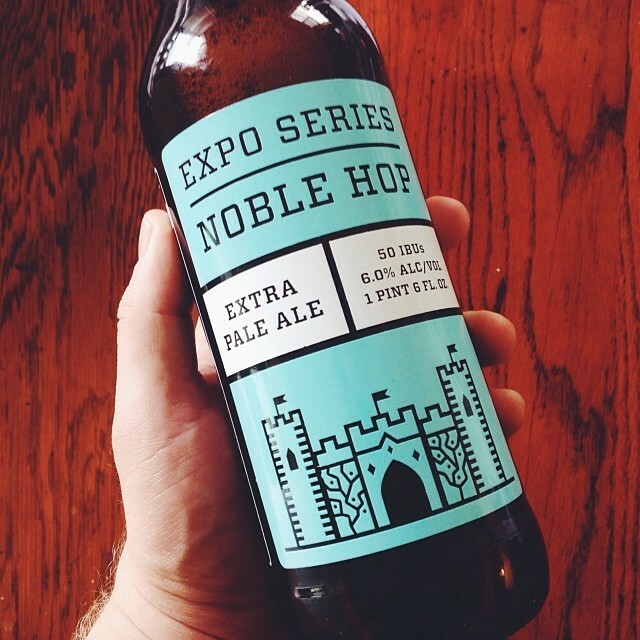 No-Li’s latest in its Expo Series is Noble Hop, an extra pale ale. I haven’t had a chance to try it yet, but it better be delicious since the bottle is my favorite color. And on a sadder note, the craft beer community is mourning the death of Jack Joyce, who co-founded Rogue Ales in 1988 and helped forge the path for the resurgence of local craft brewers. Finally, it’s not possible to write a blog post for the Inlander this week without mentioning Volume, our massive music festival, but fortunately there’s a good reason to mention it here. We’re setting up Volume HQ at the parking lot on Sprague across from the Satellite and Irv’s, and joining us will be several food trucks: Bistro Box, Shameless Sausages, King of Tacos and Fatburger. And you should buy a Volume wristband because it will be a fun time — and you get discounts at Bistango, Rock City Grill, Atticus and River City Brewing — but you don’t need a wristband to come enjoy our mini food truck rally.